"Rich Doyle, Harpoon's CEO and co-founder, first tasted this Belgian style beer in Brugge three years ago while traveling on a Harpoon beer culture trip. He immediately fell in love with the beer and wanted to brew a batch ever since. 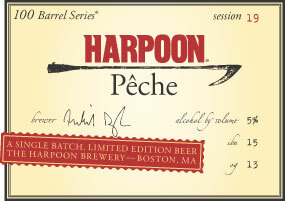 For this beer, we had to get into de special Pêche mode. Given the previous 100 barrel offerings, it didn't take much. It pours a light yellow color into a cloudy body with a large, off-white fizzy head that fizzles away, leaving random specks of lacing in its wake. Slightly hazy body that is very active, with very fast rising carbonation. Aroma is of a dulled-down peaches, accompanied by a musty, cobweb-like yeast characteristic. The taste is delicious, with a very smooth, velvety sweetness that is carried by a gentle carbonation, reminiscent of a warm, ripe peach that is exploding with flavor. Light bodied, it has a slightly creamy texture, just beyond watery, that leaves enough of a reminder to make us have another sip. A great fruit beer that isn't overly fruity or sweet, it has an appealing body and an enticing aroma.